May 6, 2013: The global union movement has welcomed the European Commission’s commitment to press Bangladesh to meet international labour standards. European Commissioners Catherine Ashton and Karel De Gucht made the pledge in a joint statement following the horrific building collapse in Savar, Bangladesh that has claimed some 600 lives and left many more seriously injured in one of the world’s worst industrial disasters. The threat of EU action under the Generalised System of Preferences (GSP), rarely invoked, further underscores the concern. “The EU should use its considerable leverage to encourage brands sourcing from Bangladesh to sign up to a binding and enforceable agreement on fire and building safety, in which workers and trade unions play an active role,” said Jyrki Raina, General Secretary of IndustriALL Global Union. “The industry’s promotion of corporate auditing to identify and remedy problems is yet again revealed as a cruel hoax, as corporate auditor BSCI had recently certified factories operating in the Rana Plaza building,” said Raina. “A voluntary approach that relies merely on corporate goodwill – which has been largely absent – would be a mistake. Promotion of more corporate auditing is no solution to the problem,” said Raina. The factories in which garments are produced in Bangladesh for the leading global retailers are well known to be death traps. The situation is made worse by the complete hostility towards trade unions by both the government and garment producers’ associations in Bangladesh. The government has for years refused to register unions in the garment sector. Only due to substantial international pressure have new unions begun to receive legal recognition in the past months. The ITUC, IndustriALL Global Union and IndustriAll European Trade Union say that the EU must also not view the situation as a safety and health matter alone. If workers have a strong union, it is far more likely that they will be able to negotiate for safer workplaces and to remove themselves from danger quickly when it arises. The EU must therefore ensure that freedom of association is at the centre of any engagement with the government. Along with this, pressure must be put on the industry and the government, to ensure that workers are paid a living wage. The government, under employer pressure, has refused to raise the $36 minimum monthly wage. “New legislation that complies with ILO standards and the efficient registration of new unions will be vital to avoid future tragedies. The current labour code amendments recently passed by the cabinet leave many issues raised by the ILO and trade unions regarding freedom of association wholly unaddressed,” said Sharon Burrow. “The EU must also insist that those responsible for the torture and murder of trade union activist Aminul Islam last year be arrested and prosecuted without further delay,” said Burrow. A recent report by the US trade union centre AFL-CIO “Responsibility Outsourced” details the appalling track record of corporate-backed “social audit” firms, including other cases where auditors failed to act on fatally dangerous factories and helped companies with US-style union avoidance strategies. IndustriALL: Tom Grinter +41 79 6934499. May 1, 2013: I came to Istanbul to take part in the biggest May Day rally in Europe, to join the celebration and to support the determination of Turkish unions to fight for legislative implementation of labour rights. Workers planned to gather in Taksim Square, the ceremonial site of the struggle since 1977, a place people celebrate and remember the people who were shot and killed in this very square in 1977 as they celebrated May Day. But this year the Turkish Government showed that democracy is not genuine as they were determined to blockade workers from gathering in Taksim Square. Thousands of riot police, army and special forces lined the streets. Tear gas, pepper spray and water cannons have been used to break up groups as small as 3 or 4 people. Jammers are being used to block mobile phones so people cannot use twitter or text to arrange meeting places. Two of our union headquarters are under siege with injured workers inside. This is democracy under threat. The legacy of today oppression will be long lasting in the hearts and minds of workers. The Turkish Government has been shamed in the eyes of the world. 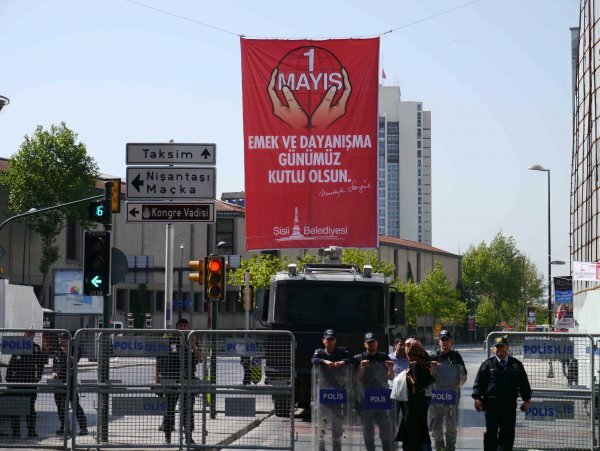 This brutal crackdown by the government to stop our brothers and sisters celebrating May Day has unmasked the truth face of the Turkish Government. April 30, 2013: The Arthur Svensson International Prize for Trade Union Rights for 2013 has been awarded to Russian trade union leader Valentin Urusov. 24 April 2013: A discredited ‘Corporate Social Responsibility’ (CSR) approach is being used to paper over the cracks of Qatari labour law, which is failing to protect migrant workers, warns the International Trade Union Confederation (ITUC). A raft of ‘workers’ charters’ have been announced from the Qatar Foundation and Q22 Supreme Committee, yet none of these documents have been released to the public or discussed with unions, and workers remain in the dark about their rights. 2013 is giving us a shameful death toll in workplace fatalities and accidents. 26 April 2013: 2013 is giving us a shameful death toll in workplace fatalities and accidents. No later than Tuesday we had to deplore the deaths of over 200 Bangladeshi garment workers following the collapse of their workshop in Savar on the outskirts of Dhaka. This tragic event takes place just days before workers across the world unite on the International Commemoration Day for Dead and Injured Workers to commemorate the victims of employers’ reckless behaviour. What happened in Savar was not an “accident”. “We receive reports of workers dead, injured or suffering from diseases contracted at their workplaces every day – and even if chronically underreported in official statistics, experts estimate that around a million workers get injured every day! What are governments looking at? Don’t they realise that there is a systemic failure when working people have to choose between their own lives and their families’ bread on a daily basis?” asked Sharan Burrow, the General Secretary of the International Trade Union Confederation, one of the promoters of the Commemoration Day. In addition to the hundreds of thousands of deaths associated with workplace accidents, we must also remember those who die from occupational diseases such as work-related cancers. The World Health Organisation estimates the annual death toll from asbestos-related diseases at 107,000 each year. Although this shocking tragedy happened in a developing context, the situation in the developed world is not improving. In the name of competitiveness and public deficit reduction, governments are implementing austerity measures that are eating away at vital regulatory instruments that protect workers and their families. “Rather than slashing social benefits or public services, leaders should be focusing on the huge cost for the State of letting this massacre go on and focus on prevention and strong health and safety regulation and enforcement,” Burrow concluded. Migrant workers in Qatar have no labour rights, wages are exploitative and occupational health and safety risks are extreme. Several hundred die each year, and the death and injury toll is rising as the huge 2022 World Cup gathers pace. Through the International Workers’ Memorial Day, the ITUC hopes to shed light on the crucial role played by trade unions, strong regulation and effective enforcement in securing safer workplaces. Early indications suggest there will be a record number of workers in 100 countries making a stand for safety on 28 April. Activities include work stoppages, respecting a minute’s silence, flash mobs, art fairs, holding training sessions, undertaking workplace inspections and taking to the streets in demonstrations. There are almost 360,000 fatal occupational accidents in any year, and almost two million fatal work-related diseases. Every day, more than 960,000 workers are injured and on average 5,330 workers die because of work-related diseases. Regulation, employment, and the economy: Fears of job loss are overblown, EPI, April 2011. The EPI paper concluded “debates over regulations have often relied on exaggerated estimates of the compliance costs they will produce.” More related resources. Flexible with the truth? Exploring the relationship between labour market flexibility and labour market performance, TUC, 2010. The ‘union safety effect’ has been demonstrated in a number of major studies, which have demonstrated safety and health improve with active workforce participation.